Each year, I try to post various back -to- school posts with helpful hints on how to organize type 1 diabetes. Click here for a low blood sugar printable. Click here for a lunch box carb count. This year, I am sharing several fun and easy ways to create low blood sugar boxes. 2.) Stickers, craft paper, markers, glue, tape. 3.) Your favorite low blood sugar foods. To get started, grab your empty box and let your child go wild with personalization. My girls have been making these for many years (and my apologies for the over-abundance of pink!) and love to create containers that reflect their individual tastes. Sorry parents of boys, this is the only blue in our lives and I LOVE blue! Over the years we have gone from Dora The Explorer to university designs. Anything goes as the goal is to create a unique box that your child and school staff will recognize in an emergency situation. The only 'requirement' is to add the child's name with either a Sharpie, label maker or alphabet stickers. Hint: Let your kiddo pick out their favorite glucose items. Once you have the box the designed, go ahead and fill it up. We usually choose a variety of sugary items. Everything from glucose tabs to Smarties to Skittles. My kids have learned over the years that it is best to choose items that can withstand higher heat, won't smoosh and are quick to eat. I do give them a bit of free reign to choose items that they like as during a low situation, the eating is simply about feeling better. If they won't eat it, then there is no point to packing it. If in doubt, employ the trusty 'kids first, diabetes second' theory. Storage ideas out of recycled materials. This year, my youngest daughter asked to host a back -to- school sleepover. Her idea was to bring several friends over and create special locker organization for school. 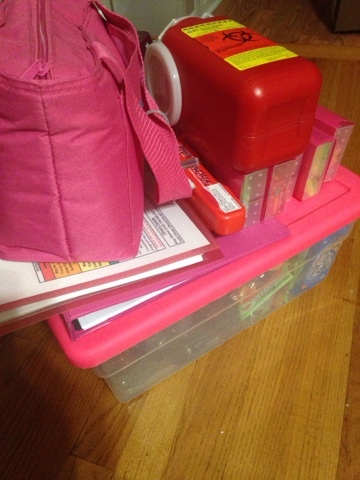 While her needs are a bit different than her peers in terms of needing not only to have school supplies available but also to have glucose handy in her locker, all of the girls ended up creating amazing storage spaces that will work for any need. All they used were empty shoe boxes and lids, recycled containers and lots of embellishments. Magnets were added on the back so that the storage could be used on both the inside of the locker door and the main locker compartment. Happily, while this works out well for type 1 diabetes needs, our youngest daughter feels very empowered as she knows that she has a super cool, one-of-a-kind locker. Important stuff for her first year of junior high. The items that will be displayed in our youngest daughter's locker. Hnt: Create a multi-class low box system. Keep the color, style, location in the class the same for easy recognition. If you happen to have a child like ours that will be changing multiple classes this year, you may want to consider purchasing a set of pencil boxes, one for every class. Hint: Be sure to write in the need to carry a bag or purse into your child's 504 Plan. If your child doesn't want to do that, than glucose must be carried on them. We found these adorable plastic containers at the Target dollar spot. Just two inches wide, they are perfect for pockets and purses. We also found a smaller size container that can be clipped to a gym bag or back pack. The size is too small for glucose tabs but it might work for other items. Don't be afraid to try many ways of storing items. We feel a bit like squirrels but truthfully, the old adage of 'glucose, glucose everywhere - UNTIL you need it!' rings true. Hint: Look EVERYWHERE for containers This pill container can hold 15 grams of sugar from Skittles. And label, label, label! Everything needs a label! True story, in our Kindergarten days, a child would often help themselves to our daughter's low box and take a juice box. The teacher didn't realize it was happening as during snack time, many of the kids brought the same brand of juice. Since our daughter wasn't having many recorded low blood sugars, we were surprised when a note came home asking for replenishment of juice boxes just a few weeks after school started. The teacher quickly figured it out and after that, all of the items were Sharpie labeled. It helped many times in the grades after. Trust me when I say your child will be very popular for always having juice and snacks! Hint: Bag tags are not just for bags. You can use these on coats too and even add a reminder of T1D. The low blood sugar boxes are different from medical supply boxes. For the above reason, I tend to ensure that the school staff keeps these items in a secure location. Hint: Use a rubber band to add a syringe to the glucagon if your are dosing smaller amounts. Be sure to talk to your endocrinologist for the amount to be dispensed for your child BEFORE doing this. When your child is old enough, they can also carry medical items in their back packs and purses or safely store in their locker or car. In preparing for the long school days ahead, you may want to also send a charger in your child's backpack. To avoid confusion of why they actually carry this type of charger (avoid the MOM - It doesn't match my iPhone issue), simply add a charger tag. We found ours at Amazon for just a few dollars. Hint: If the charger works for multiple items like Dexcom and Kindle, be sure to specify that. Finally, this is a great time to assess your home storage for type 1 diabetes. In our family kitchen station, I added several grab and go ziplock bags with single infusion site changes. As my girls have grown, there have been site changes occurring at school. Often, they forget to tell me that they need to replenish a backpack, purse or locker medical supply box. This was our easy solution as it is a visual reminder for all of us, especially as we are in and out of that kitchen station often. Hint: Grab and go infusion sites in single sandwich baggies. Two kinds of insulin pumps = two kinds of baggies and infusion sites. 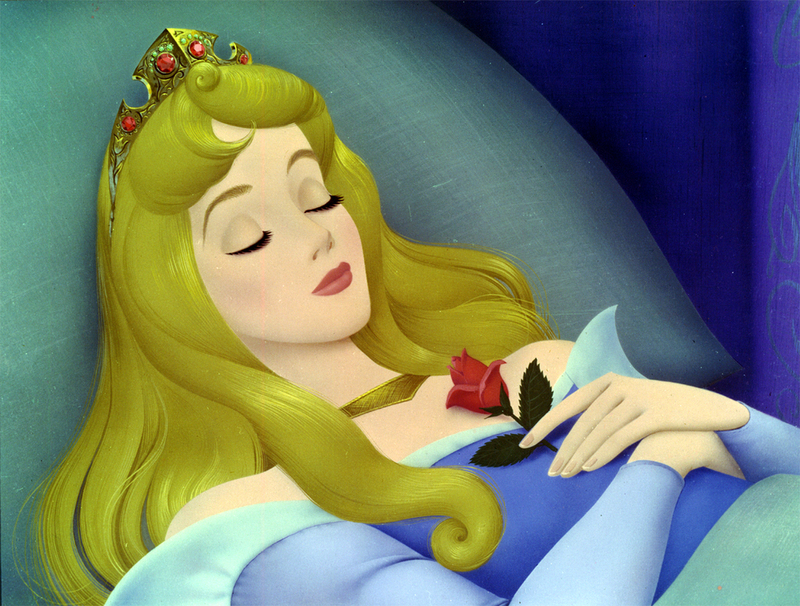 Pretty Safe to Assume That Sleeping Beauty Is Not A T1D Parent! It's 11:21 p.m. and I have been 'sleeping' for about an hour. I'm in my office and chugging my umpteenth bottle of water for the day. I feel twitchy and restless as sometimes happens as a mom of two with T1d. Even though I logically know everything is fine, my head just can't (or won't) settle down enough to fall asleep. So if you can't beat it, write it with a goofy (yet true) nonsensical blog entry of my very own version of Insomnia: A Top Ten Countdown of Random Thoughts! 10. - I'm thirsty. How much water did I have have today? Definitely not enough. Am I dehydrated? 9. - It sure was hot today. Glad I am indoors with air. Wait, why is it so freaking hot in our house? 8. - Is the air on? I hope it didn't break. That's an expense we don't want right now with the kids. 7. - Kids! How are the kids sleeping in this heat? Hubby sleeps through everything. Grrr. 6. - Wait, why haven't I heard any noises from the kids' rooms? It's too quiet. Are they dehydrated? 5. - Is the Share working? I better check. Wait. Is the volume on the cell phone on? I better check. 4. - Maybe I am awake for a reason? Maybe I am not supposed to sleep in case something happens. 3. - Did hubby check their blood sugars before he went to sleep? How on earth is he sleeping? Grrr! 2. - I better check the Share again. Maybe it is not working. I better just test the girls directly. 1. - Perfect numbers? How is that possible? I better stay awake and check again in a few hours.